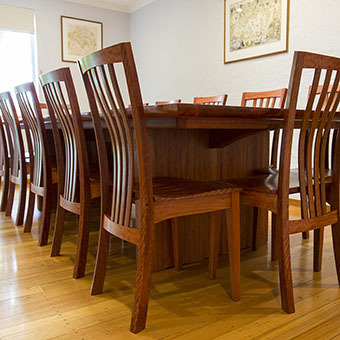 Rolf Barfoed fine furniture clients enjoy signature pieces from a nationally-awarded and internationally-trained Canberra craftsman. Our design experience, materials choice, and craftsmanship combine to produce stunning and high-functioning furniture. Drawers glide effortlessly, doors close seamlessly and exemplary construction promises decades of use and lasting beauty in each piece we create. 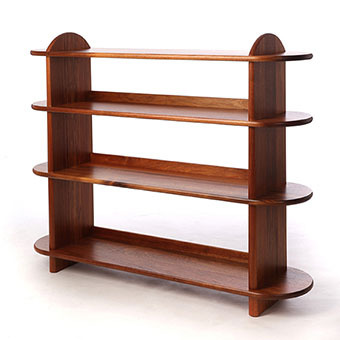 or specialist storage for your home, we craft quality timber furniture tailored to suit you. they can show our artistry. Visit our online gallery to see examples of our work. 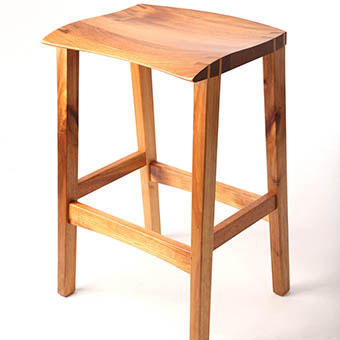 Rolf Barfoed is a furniture designer and maker based in Canberra. Rolf was trained under leading craft practitioners in both Australia and England. At the heart of his furniture is functional design and a passion for craftsmanship that can be seen and felt in each piece he makes. As well as making his own furniture, Rolf manufactures for other designers; putting several designs into production alongside bespoke pieces and prototyping. Rolf is excited about the growing interest surrounding locally designed and made things and the opportunities for collaboration across disciplines. 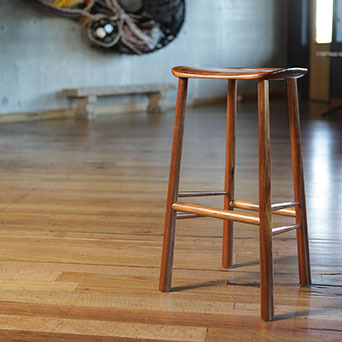 It’s a great time to be part of the Australian furniture industry. my life and I can’t wait to get into the workshop every morning. The gallery displays a selection of Rolf’s bespoke commissions and production furniture. We welcome enquiries regarding the works in the gallery and we’re always interested in designing something to suit you. For queries regarding design and timber options please contact us. We have a kitchen with plenty of floor space but limited bench space for food preparation. I commissioned Rolf to build a unique mobile chopping board and storage device. Prolonged food preparation on our existing benches also gave me a backache — as the benches were too low. So Rolf and I worked together to come up with something that expanded my workspace, gave me extra storage and maximized good ergonomics for food preparation. I was very impressed with the way Rolf understood my needs and was able to reflect these in several design drawings. Needless to say it didn't take long to work out a configuration that would suit all my needs — with flair, comfort and innovation. We worked out ergonomically the best chopping height, with the help of my wife, a physiotherapist. 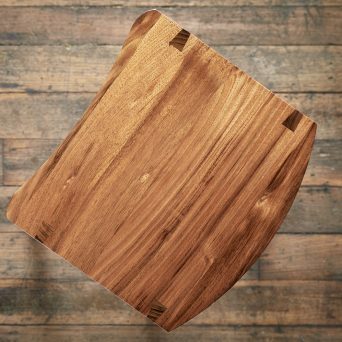 The next issue was the choice of timbers for the construction — we settled on the beautiful red stringy-bark and jarrah for the chopping boards. Over the coming months Rolf would drop by with photos and pieces of what we now named the 'Nomad'. It was gratifying and fascinating to watch the evolution of this practical piece of art. I was particularly excited about the pull out workspace-extenders at either end of the Nomad. A significant observation over this period was the extent to which Rolf constantly tuned into my needs and reactions as the Nomad evolved. I really appreciated his ability to align his work to my needs — making adjustments as progress was made. He was quite particular to ensure that I was happy with each major step of the construction. This style served to enhance my sense of engagement in this project. Needless to say I absolutely love the final product — the night it was unveiled was like getting a brand new piece of high quality art. I use the Nomad constantly and cannot do without it in the kitchen. The art of fine food preparation is made easy and a pleasure through the Nomad. I have very high praise for Rolf and his unique skills, not only as an extraordinary craftsman, but also as person of great integrity and empathy when it comes to working with his clients. His extremely high standards and his eye for perfection will ensure all his products endure time and maintain their beauty and function for centuries. Rolf repaired a treasured 17th Century English oak chest that had been my parents' pride and joy. He spent time to research the methods and the materials that had been used in England 400 years ago to ensure that the repair was as authentic and non-invasive as possible and the results are great. I highly recommend Rolf for his meticulous craftsmanship, fair pricing and punctuality. 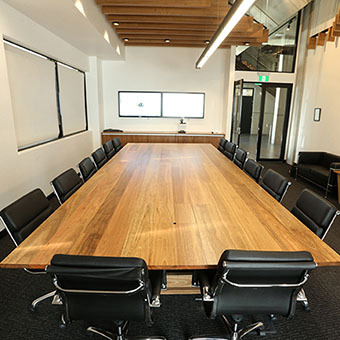 Upon the opening of our new, state of the art facility, a Board table was required; one that reflected the quality design and finish of the building we were moving into. Rolf was recommended to us for his high quality craftsmanship and attention to detail. The task of building a large Board table was accepted by Rolf and he provided experience, guidance and concept ideas from which we chose the final design. Throughout the build process he ensured that we were kept up to date with regular updates and photos of the table as it progressed from concept to reality. The final result is a beautiful piece that is complimented heavily by the many that pass through our Boardroom. It makes a statement and the quality workmanship is evident. Thank you Rolf for your talent, passion and high quality craftsmanship. The table is a talking piece that will be admired for many years to come. Evan Dunstone, Designer/Maker and Churchill Fellow 2001, owner of Dunstone Design Global PTY LTD.
Rolf Barfoed worked for me at Dunstone Design for more than five years. During that time, Rolf made some of our most challenging commissions. Rolf is already an elite craftsman and I now believe that he is going to be an equally exciting designer. There is no other young Australian maker who has the same combination of training, talent and experience. 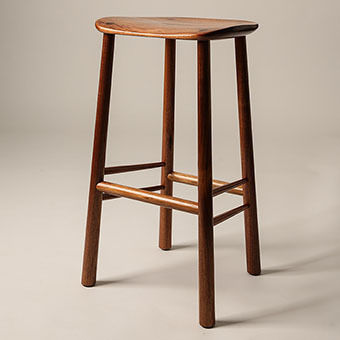 It is my opinion that Rolf is the pre-eminent Australian wood craftsman of his generation. Whether you are looking for a piece of furniture to fit a particular space or function, or something that you have always wanted but could never find, we can design and create a solution. a pleasure to live or work with, and a delight to use. • Made to commission — a truly bespoke piece where it has been designed and made as a one-off for a particular person, event or place. • Made to order — based on an existing design but still bespoke and made with your choice of timber, size and including any other modifications. • Batch produced — our limited-edition signature pieces. In addition to crafting fine furniture, we are equipped and have the industry contacts to produce anything from timber. Complex problems are our forte. We can engineer any design from a small side table to a complete suite of furniture, or a full production run. We welcome collaborations with other designers, craftspeople and tradespeople. The commissioning process begins with you. Whether you present us with a formal brief or general idea, we will discuss your needs and produce concepts and samples for you to review. We produce accurate drawings and models to ensure the final product reflects your expectations. Once you're happy with the concept we will provide you with a delivery date and price. Read about all the latest updates, works and everything Rolf has to say here! Want to commission a piece or have a space you’d like fitted? Subscribe to our Newsletter for all the latest updates and specials on offer.